After fleeing a Dickensian childhood in the Midwest and following a stint as a dancer in New York, ambitious Lucille Le Sueur arrived in Hollywood in 1925, changed her name to the more marquee-friendly Joan Crawford, and launched one of the most illustrious careers in movie history. Always a resilient, adaptable actress, Crawford embodied the "jazz baby” of the 1920s, the struggling shopgirl of the Depression era, and the determined career woman of the World War II years, highlighted by her Oscar win for 1945’s Mildred Pierce. Eager to become a mother, Crawford adopted a daughter, Christina, in 1940. Subsequently she adopted three more children — a son, Christopher, and twin girls, Cathy and Cindy. Crawford continued working —1962's Whatever Happened to Baby Jane? opposite Bette Davis was a late-career box office smash—until 1972, when she retired to her New York apartment until her death from cancer in 1977. 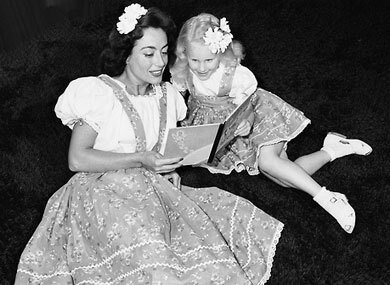 A year and a half after Crawford’s death, Christina, who along with her brother, had been disinherited by her mother, wrote the shocking, best-selling exposé Mommie Dearest. With it and the horrific film adaptation, which starred Faye Dunaway as a Kabuki-monster version of Crawford, the actress’s reputation would forever be sullied. Donald Spoto, author of best-selling biographies of Audrey Hepburn, Marilyn Monroe, and Tennessee Williams, among others, was 11 years old when he became a Crawford fan after watching her Oscar-nominated turn in Sudden Fear in 1952. “Her performance knocked me out,” he says. Spoto wrote the actress a fan letter, and to his surprise she responded personally, an anecdote he uses to open his latest book. Using newly discovered archival information and exclusive interviews, Spoto has created an illuminating, three-dimensional portrait of a complex woman in Possessed: The Life of Joan Crawford (William Morrow, $25.99). Spoto speaks with The Advocate about Crawford’s relationship with gay men, her rumored bisexuality, and the truth about her daughter’s scandalous book. The Advocate: Since there have been so many biographies written previously about Joan Crawford, did you chiefly set out to repair the damage of Christina’s book? Donald Spoto: I didn’t approach the topic with an agenda. What I realized was that Joan Crawford was considered a star and a personality but was not taken seriously as an actress. I wanted to set the record straight about her talent. I think she was one of the greatest screen actresses of the century. It’s very gratifying as a biographer to find out that people are not the dreadful monsters they’re often portrayed as. Joan wasn’t Joan of Arc, but she was also nothing like the character Faye Dunaway played in Mommie Dearest. Many other books portray Joan as a very complicated person, but in yours she also comes off as incredibly likable. How do you find new information on a woman who has been dead for over three decades? I spoke to people who worked with her and knew her, I went to the archives, and I had material from writing other books and talking to people from the Golden Age who are no longer with us. At the New York Public Library, I discovered receipts and letters for an extraordinary list of charitable donations she made. She refused to allow these philanthropic organizations to publicize her donations. She didn’t want to be thanked or admired. She had a good and comfortable life, and she felt she had to give something back. I believe a biographer is obliged to tell the truth even if it means saying something good about somebody. Were people who knew her eager to speak with you to clear up the misperception? I’ve always respected her devotion to Billy Haines [a major silent film star whose career was cut short due to his homosexuality]. How rare was it for a starlet in the ’20s to become a close friend with an openly gay man? It was more common than people think, but people who befriended [openly gay people] did it without talking about it publicly. Joan, however, insisted that [Haines and his partner, Jimmy Shields] come to dinner parties at her home, she introduced them as a couple, and she would not hear a word against gay people. It had to do with Joan knowing what it was like to be denigrated and despised. She would not allow anyone to be insulted or offended in her presence. How influential was Haines in her career and life? In her early career, he was very influential. When the option on her contract was up every two or three months, which is how it was for the first few years at MGM, Billy launched a campaign, saying “Isn’t Joan doing wonderful work?” and “Doesn’t she have such a future here?” She paid him back the best way she knew how. When he quit/resigned/was fired she supported him in getting started as an interior designer. She gave him money to start his business, and he became one of the most important and gifted designers in Hollywood. Other biographers have stated that Crawford was bisexual and have speculated on affairs with Marilyn Monroe and Barbara Stanwyck, among others. Did you find any evidence of this? Not at all. I heard tales and read about them in books I’d rather not discuss, but you look in vain for sources for these rumors. If Joan Crawford had had all the affairs that some writers claim, she wouldn’t have had time to make so many movies. Another rumor you dispel is that Joan and Bette Davis feuded and had a contentious relationship during the filming of What Ever Happened to Baby Jane? Joan and Bette were both quite clear that during the production the publicist for [director Robert] Aldrich said to them that even before the film’s release there would be a lot of free publicity if the two of them were presented as being at each other’s throats. They both said they could do this for the movie, but they weren’t going to give interviews that said that or pose for photos suggesting that. In fact, if you look at stills from the set, they’re either going over the script or having a laugh or discussing something serious with Aldrich. Of course, the imagined feud made for good publicity. The fact is they didn’t become good friends, but they weren’t mortal enemies. They would never say or do anything publicly to embarrass themselves, such as appearing jealous. There’s the often repeated story that Crawford was jealous that Davis received an Oscar nomination while she didn’t, so she arranged to accept the Best Actress award if someone else won. You have her rather magnanimously hoping that Davis would win. Yes, Joan was convinced that Davis would not only be nominated but would win. She was disappointed that she didn’t, but she couldn’t say that publicly as an Academy member. Crawford realized she had the less showy role in that film. Why do you think so many gay men are drawn to Crawford? You describe Mommie Dearest as “the work of a somewhat hysterical imagination.” What evidence did you find that suggests the book wasn’t factual? Did you attempt to interview Christina Crawford? Yes, but she doesn’t give interviews anymore. I respect that, but I think that in itself is ... interesting. Christopher is dead. I don’t say anything bad about Christina, and I think she regrets saying some of the things she did. It’s not for me to judge her but just assess the book and weigh it against the truth. In that regard it comes up very short. How do you think Joan would like to be remembered? I think she’d like to be remembered as a hardworking actress who tried to entertain and do good work and as a good mother and a loyal friend. She would be the first to say that among her movies there were a fair number of duds. She would be the first to say she made a fair number of mistakes with the children and didn’t give them enough of her time and put her career first. That’s one of the qualities that makes her an essentially positive figure. She didn’t try to defend herself or gloss over her faults.